Infrared (IR) thermal imaging has been used to inspect electrical systems for some time now and its use has steadily grown increasingly popular. Since components in electrical systems almost always overheat before they fail, problem areas are more easily and safely found when viewed through an infrared (IR) thermal imaging camera. ​During an inspection, electrical equipment, such as distribution panelboards, switch boards, contacts, transformers, receptacles, and service and control panels, can be examined through an infrared (IR) thermal imaging camera. ​By viewing apparent temperature differences, we are able to identify and document problems, such as loose connections and overloaded circuits, which are the most common causes of electrical fires. Because viewing apparent temperature differences through an infrared (IR) thermal imaging camera requires no physical contact and can cover a lot of space in one sweep, no other technology allows electrical faults to be found as safely and as quickly as infrared (IR) thermal imaging. In high voltage installations heat is an important factor. When electrical current passes through a resistive element, it generates heat. An increased resistance results in an increase in heat. Over time the resistance of electrical connections will increase, due to loosening and corrosion for instance. The corresponding rise in temperature can cause components to fail, resulting in unplanned outages and even injuries. In addition, the energy spent on generating heat causes unnecessary energy losses. If left unchecked, the heat can even rise to the point where connections melt and break down; as a result, fires may break out. An infrared (IR) thermal imaging camera will help to accurately locate the problem, determine the severity of the problem, and establish the time frame in which the equipment should be repaired. One of the many advantages of infrared (IR) thermal imaging is the ability to perform inspections while electrical systems are under load. ​Since infrared (IR) thermal imaging is a non-contact diagnostic method, an infrared (IR) thermographer can quickly scan a particular piece of equipment from a safe distance, leave the hazardous area, return to his office and analyze the data without ever putting himself in harm’s way. Infrared (IR) thermal imaging cameras are used for inspections of electrical systems and components in all sizes and shapes and their use is by no means limited to large high voltage applications alone. 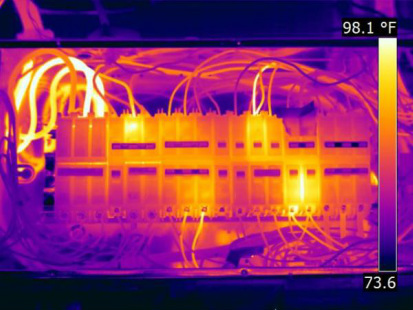 Electrical cabinets and motor control centers are regularly scanned with an infrared (IR) thermal imaging camera. ​If left unchecked, heat can rise to a point that connections melt and break down; as a result, fires may break out. Besides loose connections, electrical systems suffer from load imbalances, corrosion, and increases in impedance to current. Infrared (IR) thermal imaging can quickly locate hot spots, determine the severity of the problem, and help establish the time frame in which the equipment should be repaired. These and other issues can be spotted at an early stage with an infrared (IR) thermal imaging camera. This will help to prevent costly damages and to avoid dangerous situations in your Kitchener, Waterloo, Cambridge, Guelph, Brantford & London area home or business.